Home » Tomorrow » What will we learn from a year in space? What will we learn from a year in space? During a yearlong mission, scientists will study how the human body adapts to space. Artist's concept: NASA. At the end of this month, two astronauts -- one American and one Russian – will leave Earth to live on the International Space Station for an entire year. Scott Kelly, 51, a NASA astronaut, and Mikhail Kornienko, 54, a cosmonaut with the Russian Federal Space Agency, are scheduled to board a Soyuz spacecraft on March 27 and travel to the space station, in orbit some 200 miles above Earth. Expeditions typically spend about six months aboard the station. So what can scientists learn by putting two guys in space for a year? 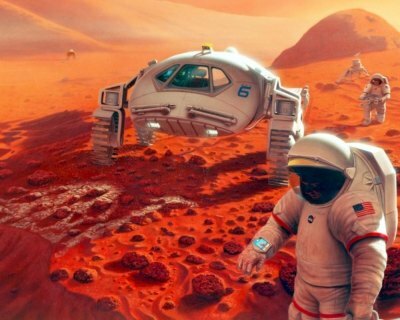 If astronauts are to travel to Mars, NASA must know how a long flight in space will impact the human body. Researchers will study the effect of a year in space on vision, physical performance, the way astronauts handle functional tasks, behavioral health, human factors, and metabolic and microbial development. In other words, everything from the way people move to how they digest food. Living in space can be tough on the body. One study that will be conducted on the yearlong mission involves the eyes. When astronauts experience microgravity, body fluids shift toward the upper body, according to NASA. This can result in intracranial pressure and vision impairment. Another example is the impact of space flight on reasoning and alertness. When astronauts arrive home from the station, they experience problems adjusting. Some find simple movements, such as standing up straight, difficult. A Russian, Valerie Polyakov, who is also a physician, already holds the record for consecutive days in space. In 1994, he spent 437 days on the Mir Space Station. By studying the Kelly twins, scientists will be able to evaluate the impact of one year in space on Scott Kelly by comparing his body's changes to those of his brother, who has the same genetics.